There are two persons: Jeff and Sarah. Together they are 43 years old. Jeff is 13 years older than Sarah. How old is Jeff? How old is Sarah? 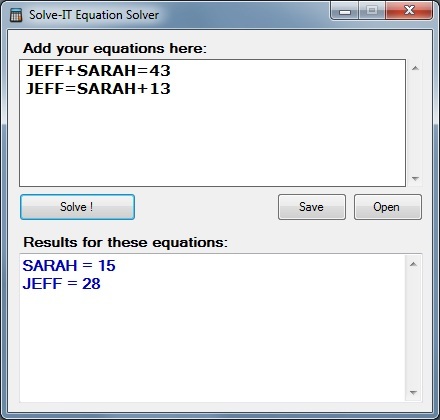 This question can be solved by turning it into 2 mathematical equations: JEFF+SARAH=43 and JEFF=SARAH+13. The correct answer would be that Jeff is 28 years old while Sarah is 15 years. This was of course a very basic question. In fact you can use the solver to calculate very complex systems with hundreds of unknown variables. This is my second version of this tool. The first version is written as a Java applet. It contained a lot of restrictions. The new version of this software was written in Visual Basic .NET, meaning you can run it on your local computer without a required Internet connection. This program can be used to calculate electrical circuits with the Kirchhoff's laws methods. A system with x variables should have x equations. You can use any number. The decimal separator may either be represented by a point or a comma sign. A variable can contain both letters and numbers but it always has to start with a letter. You don't need to use the multiplier (*) sign. If you want to use 6*A, then you can just write 6A. You cannot type A6: this would be considered as a variable name. You cannot use any mathematical functions other than + and -. Contradictory input equations will lead to undesired results. You should always review your input equations with care.